Every occasion with a theme deserves a corresponding delicious treat. 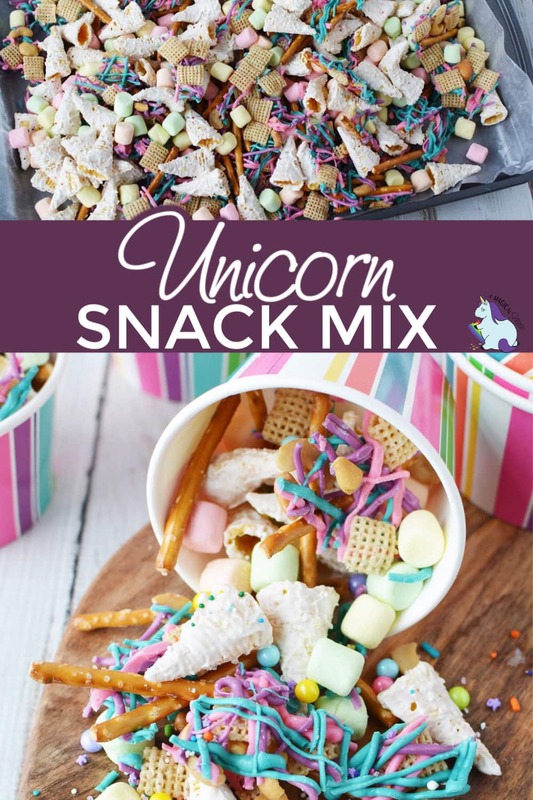 This unicorn party snack mix recipe is a wonderful success for any type of magical gathering. It’s sweet, with a little bit of salty crunch, and looks fantastic in pretty paper cups. 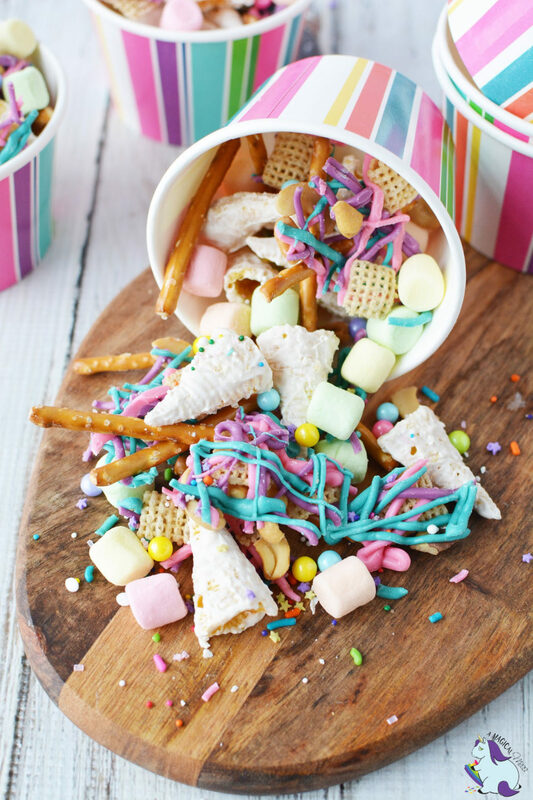 This snack mix is fairly easy to make and can be prepared in advance. Get the kiddos involved as they love to help–especially with the drizzling. If the cashews are an issue, you can omit or replace them with different nuts, peanuts, or seeds like shelled sunflower seeds. The sprinkles used here are the same as what we used in the magical unicorn bark. We found them at Meijer, but there are plenty of other options available if you can’t find them at your local grocer. This recipe uses Celebration by Frey Candy Pearls, but in all honesty, I think the Celebration by Frey Sixlets would add better flavor to the mix. If you’re running short on time, just the candy-coated Bugles as unicorn horns make a fun and yummy snack. It's sweet, colorful, and just the magical treat you need to make a unicorn party complete! Line 2 baking sheets with parchment paper. Spread cereal, pretzels, and nuts on the cookie sheets in a single layer. Place the lavender, hot pink, and turquoise candy melts into separate resealable sandwich bags and do NOT seal shut. Microwave for 30 seconds on 50% power. Knead gently with fingers and continue to heat in 30-second intervals, at 50% power, until completely melted. Seal the bags and snip the tips. Drizzle onto baking sheet with cereal, pretzels, and nuts. Set aside to set. Place Bugles into a large mixing bowl. Heat white candy melts in a separate bowl at 50% power for 60 seconds. Stir well and continue to heat in 20-second increments at 50% power until completely melted. Pour onto Bugles and mix well to evenly coat. Spread onto baking sheet and sprinkle with sprinkles. Let set to harden. Break apart the mixture of cereal, pretzels, and cashews. Mix together unicorn horns and cereal mixture. 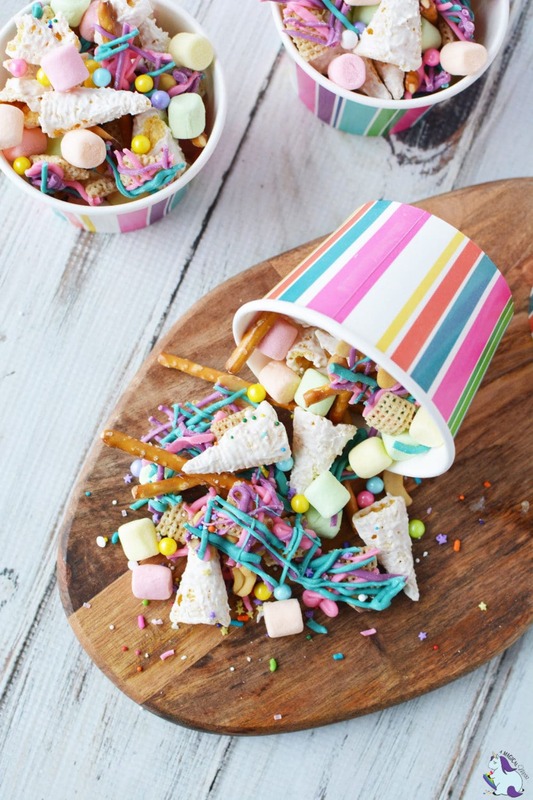 Stir in marshmallows and serve in decorative paper cups. Finding the right paper cups makes a big difference. 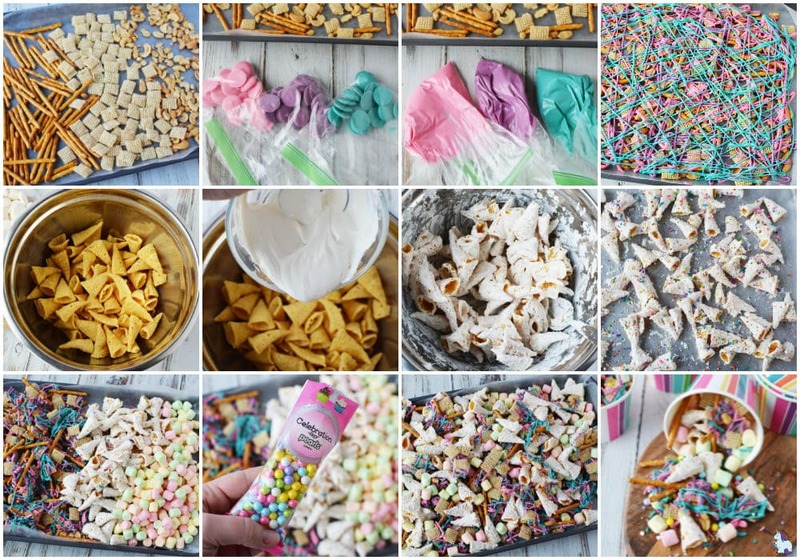 You can even wrap filled cups with clear plastic wrap and give this unicorn party snack mix as gifts for showers, weddings, and parties. The striped cups are cute, but I’m obsessed with these rainbow unicorn froyo cups with this adorable ribbon to use as parting gifts. Speaking of froyo, this snack mix makes a great topping. Consider adding it to your next sundae bar! Share this recipe with all your magical friends! 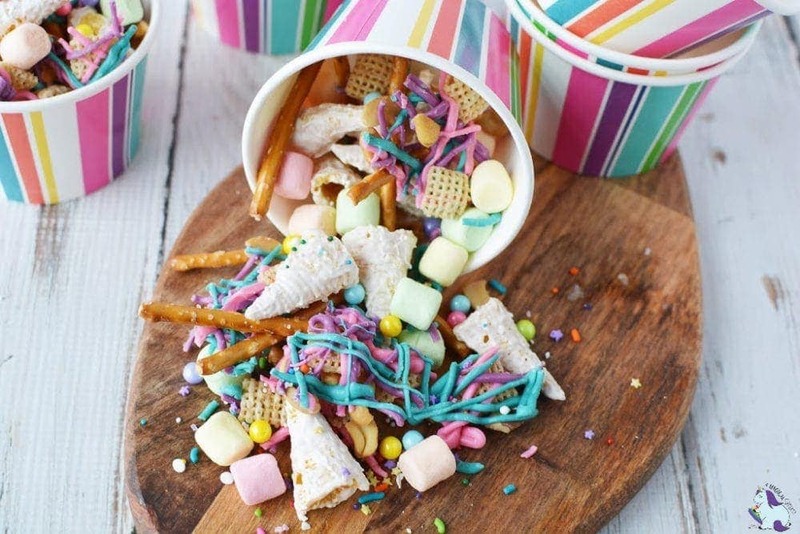 This might just be the most magical snack mix ever! So beautiful! What a fun idea for parties or just unicorn lovers in general! 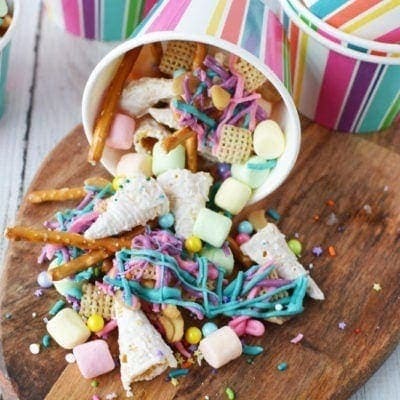 Love the colors and combination of items in the snack mix. Perfect for any type of party! I haven’t had Bugles in years! A cute addition to this colorful snack! I would totally eat this up in a heartbeat! It looks so festive and full of so many of my favorite things! It would have never occurred to me to make a recipe out of Chex cereal, how cool! Awesomely magical. Perfect party snack.